Jasmin Herrera The city estimated between 7,000 and 8,000 people showed up to march through Uptown to denounce recent ICE actions on Feb. 16. On Feb. 7, the arrest of two men in a work van at a QuikTrip gas station in east Charlotte began what would be a week of paralyzing fear for the city's immigrant community. In the coming days, word spread on social media that Immigration and Customs Enforcement (ICE) had begun staging raids and even traffic checkpoints in the area. Rumor and fact blended and it became hard to know what was true. Over the next week, however, one thing became clear: ICE was ramping up efforts to detain undocumented immigrants, and were going to new lengths to do so. For the next nine days, children stayed home from school, adults feared walking to the neighborhood supermarket for groceries and local businesses suffered. 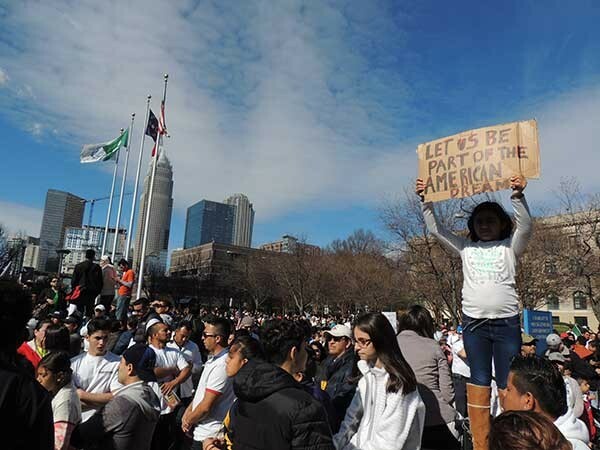 But on Feb. 16, Charlotte's immigrants stepped out of the shadows. A Day Without Immigrants wasn't expected by many to turn out the way it did. Organizers with Comunidad Colectiva caught wind of a nationwide strike — the word spread through a flyer being shared on social media — that gave immigrant business owners a chance to shut down for the day in protest of brazen ICE arrests around the country and show solidarity with one another. Businesses around Charlotte closed while owners and employees attended the march. A similar action held in conjunction with a nationwide strike on May 1, 2006 didn't turn out many people to Marshall Park. This time, organizers were on short notice, but hoped social media could help them attract 500, possibly even 1,000 people to the park. In the end, more than 7,000 people came to Marshall Park and marched through the streets of Uptown, shutting down traffic for more than two hours and sending a message to city, state and federal leaders that could not be ignored. "This is amazing. It all began with a flyer. We didn't know how many people were going to show up," said Oliver Merino, an organizer with Comundad Colectiva, as he walked at the head of the march, his bright yellow vest letting marchers know to follow him. "People are hurting. People are concerned and fearful but also, they're ready to fight. We have four years of resistance, and four years to keep our elected officials accountable. What are they doing? I think they have listened and made very timid responses, but as you can see, the people in the city are demanding more." Throughout the week, ICE officials continued to claim they were simply carrying out routine enforcement operations, while leaders in the immigrant community said the escalation of arrests has been like nothing they've ever seen. "What gets me is that, institutionally, it's like we're making this up and we're the ones creating the issues," says Jose Hernandez-Paris, executive director of the Latin American Coalition. "This has been going on for a number of years. It has been building for about 15 to 20 years now. But that's nothing compared to what's happening this time." Between Feb. 6 and Feb. 10, ICE agents arrested 84 undocumented immigrants in North Carolina. As of Creative Loafing's press deadline, numbers for the week of the march had not yet been released, as Monday was a holiday. ICE refers to those being targeted in the operation, which is being headed by the ICE Enforcement and Removal Operations office in Atlanta, as "criminal aliens, illegal re-entrants and immigration fugitives." 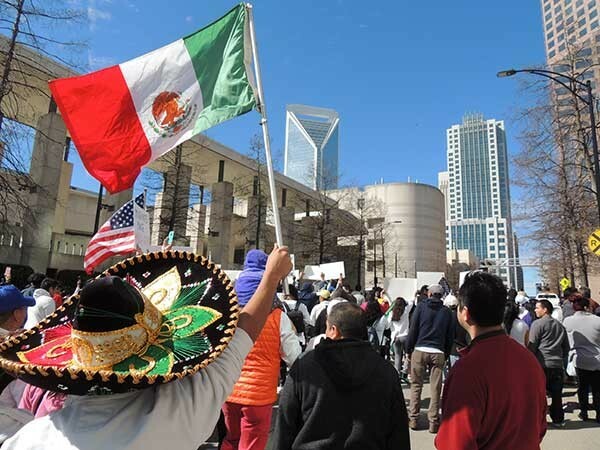 They point to the arrest of one Mexican national in Charlotte who had previously been convicted of three counts of indecent liberties with a child as an example of the type of people being arrested. Of the 190 people arrested in the Carolinas and Georgia in the first week of the new ICE operation, 127 — almost exactly two-thirds — had criminal records. 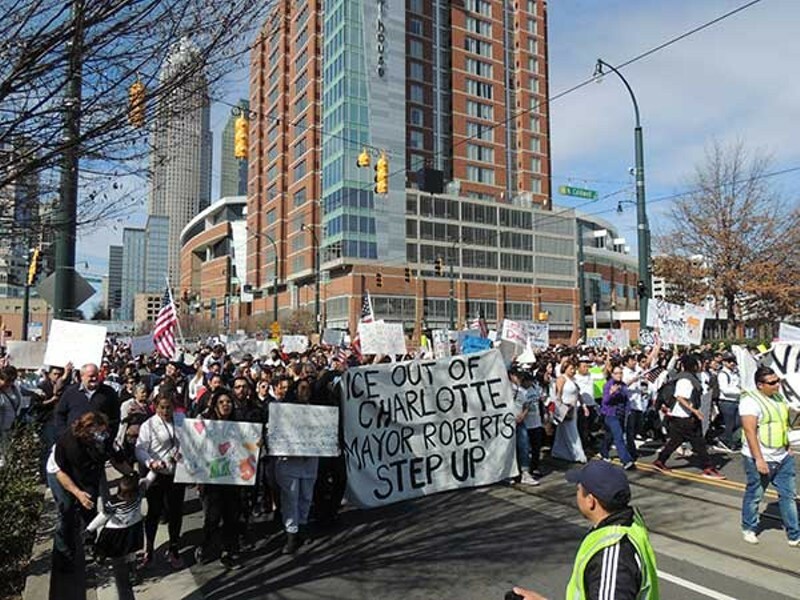 In a statement released on the day of the march, the city of Charlotte went along with the ICE narrative, stating that many reports of enforcement actions in the area had been "exaggerated or entirely inaccurate" and that everyone should just "keep calm." "[ICE] has repeatedly indicated that it is continuing its policy of focusing on people who have committed crimes in addition to immigration law violations. Although recent enforcement actions have gotten significant media attention because of the Trump executive order, according to [ICE], those actions are consistent with activity that has taken place for years under the Obama administration and do not represent a major new threat." However, two weeks in which ICE ensured people that nothing had changed from the routine, targeted operations carried out under the Obama administration, WCCB's Courtney Francisco reported on Monday that an ICE spokesperson confirmed that things have changed under Trump in a way that does not simply affect undocumented immigrants with criminal records. According to an ICE spokesperson, Trump's executive order allows ICE agents to arrest any undocumented people who are with someone being targeted by ICE, which gives the agency a broad new reach in the way they operate. This is something that's been known for weeks, and forecast for months, by people like Hernandez-Paris and Omar Jorge, partner and general counsel for Compare Foods and a board member at the Latin American Coalition. "You heard the rhetoric during the campaign, and when you talk to people from different parties with different points of view, they say, 'Oh no, that's never going to happen, he's never going to do that, that's just so he can get elected.' Well listen, I'm one of the people that believes politicians. People call me naïve because of that. No, I believe that if a politician says he wants to do something, he actually wants to do it," Jorge says. "So it was not surprising but it was certainly a shock. As it ramped up during the week last week, that's when I realized we're in a whole different situation now. Regardless of what ICE is saying — that this is normal, routine activity — this was all programmed to happen." Despite the city's assurances, many in the immigrant community have been fearful of leaving home. 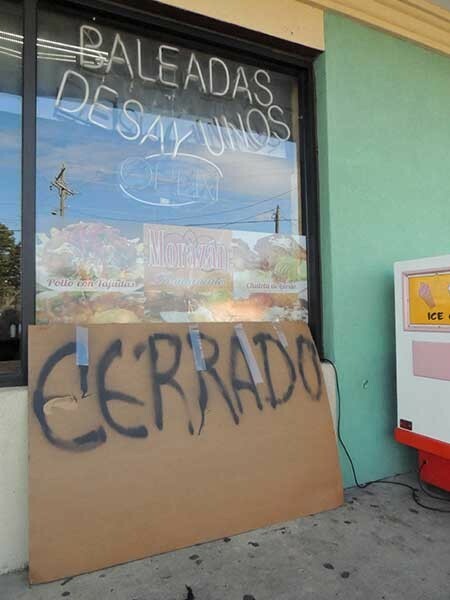 Zhenia Martinez, co-owner of Las Delicias Bakery on Central Avenue, said that for the first week of ICE operations the corridor, filled with immigrant-owned businesses, was like a ghost town. 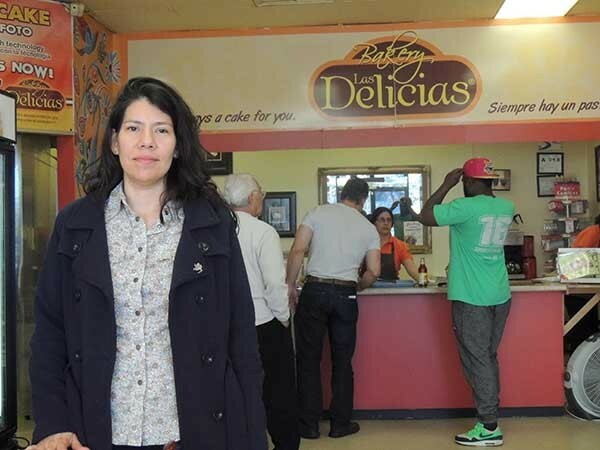 Zhenia Martinez in her business, Las Delicias Bakery, which she shut down to join the Day Without Immigrants march. "During those first two days, this whole area just seemed really quiet. It resembled days that are really, really cold. No one was out and about," Martinez says. "As a business owner you can feel that because, even on the days when my business is bad, just being able to see people walk out and about you can get the sense there's at least life going on. But then all of a sudden you saw this drop in people walking around." Martinez says her business dropped dramatically as word spread about immigration enforcement. Hernandez-Paris believes that it's all a part of the plan for Trump's new executive order. The first arrest made in broad daylight just outside the old Eastland Mall site, in the heart of Charlotte's immigrant community; the operations near places of worship and schools; targeting people at their work where they know other undocumented people will be present is all part of the fear factor meant to add to the fear factor, he says. "You arrest workers in a van in working hours in public where everyone can see it and photograph it. You arrest someone going to church. You arrest someone in close enough proximity to a school where it creates an issue. You only have to do it in strategic places. People will say, 'Nationally, it's only 681 people.' Right, but no one wants to be the next one, so when you do that, you are choking the community into submission and into fear so that they leave. So for them, it's exactly what they want. 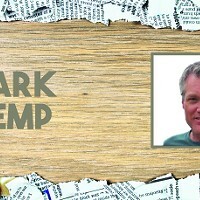 And unfortunately, the media, 99 percent of them play along those lines." For this reason, folks like Hernandez-Paris and Jorge have been struggling over the last two weeks to inform people in the immigrant community of their rights. The two became concerned after confirming reports of an operation last week in which ICE agents fingerprinted men walking into a landscaping company in apparent attempts to find one man. "The official report from ICE was, 'Well, we were just looking for one person.' But they fingerprinted 17 and seven of those were detained. But you're just looking for the one?" says Jorge. He and Hernandez-Paris have been working to make sure people know that it's OK to say no and call representation before answering any questions. "You are dealing with immigrants and they're used to a different legal system. They don't really understand what their rights are. ICE is allowed to be on a sidewalk and ask every single person that passes by to put their fingers on an iPad. But you don't have to say yes. Just because somebody's knocking on the door, doesn't mean you have to open it and let them in. In our culture, that's unheard of," Hernandez-Paris says. "You can take these steps, and it might be perceived as disrespectful, but it is legal and it is your right." In the meantime, members of the immigrant community will continue their cautious resistance. After marching through Uptown, the crowd gathered in front of the Charlotte-Mecklenburg Government Center where family members of those in custody addressed them. Martinez shut down her business on Feb. 16th and went to Marshall Park, just as her immigrant parents, the original owners, had done a decade ago. The next day, she spoke about what the experience meant to her. "It was gorgeous, being able to take North Tryon in the middle of the day," she says. "I was here for the '06 rally and there were very few people in Marshall Park. Yesterday, it was uplifting. I think it's being able to go out there and let our voices be heard that it kind of helped boost us up and let go of some of that fear. Even though the knowledge is still there that things are still happening, I think they feel better." 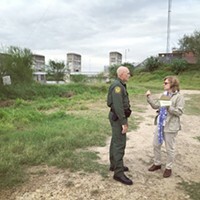 Martinez said she's already seen a turnaround in business, as the weekend following the first week of ICE operations was busier for her than usual. She noticed the same thing on the day following the march, as customers told her they wanted to support her for shutting down in support of them. As has been the case since her parents opened the business 20 years ago, Martinez values the community around her as much as it values her. "I think it's a show of support. Certainly our business wouldn't exist without immigrants," Martinez says. "When it first started, it was to feed that niche, immigrants over here that didn't have bread. Now we do have a varied clientele, but in the very beginning it was them who supported us and we're thankful for that." Although she's seen signs of life pop up once again on the eastern end of the Central Avenue corridor, she remains vigilant. Martinez emphasizes that ICE has not left because of the great turnout at last week's march, and she hopes the immigrant community — and those non-immigrants who showed up in solidarity on the Day Without Immigrants — will continue to fight against broad operations that have already torn apart the families of her friends and employees. "It's going to take some time, but I do feel that there's going to be a ripple effect and I'm hoping that people don't think that this was a one-time thing that we need to do," she says. "The way that we came together yesterday, we need to even bring in more people and more immigrants and keep on pushing." It may be a cliché at this point, but Martinez and thousands of others proved last week that for every action there is a reaction. What remains to be seen is just how they'll build on that momentum, as the federal administration they showed up to face down will surely not be taking the pressure off any time soon. Can Charlotteans Stand With Immigrants As We Did For Women?